Photos courtesy of Cultivate Kansas City. Photo credit: Ami Freeberg. “Farm” is no longer a four-letter word in Kansas City—and it hasn’t been since 2010 when the city passed a zoning ordinance allowing citizens to grow food in residential areas. Prior to the ordinance, it was illegal to grow food for profit in areas zoned residential. This made operations difficult for urban farmers, especially those whose business models revolved around growing food within the communities they sold to. Kansas City urban farmer and educator Steve Mann played an integral part in the passage of the ordinance, along with other leaders in Kansas City’s sustainable agriculture movement. Mann, who is the site developer for the sustainable agriculture nonprofit Cultivate Kansas City and a gardening educator for Food Not Lawns Kansas City, says that both farmers and city officials were eager to work together to make Kansas City more urban farm-friendly. The new ordinance divided urban agriculture into four categories: home gardens, community gardens, crop agriculture, and CSA farms. The definitions of these categories are relatively self-explanatory. A home garden is classified as a garden located on-site where the individual maintaining it lives. A community garden is maintained by a group of individuals gardening for personal consumption, sale, or donation. Crop agriculture is growing and harvesting food for sale at an off-site location (or on-site with special permits). And a CSA is growing and harvesting food for shareholder consumption. Since the passage of the ordinance, urban agriculture operations in Kansas City have proliferated as abundantly as the crops they grow. Specifically, Mann has noticed a few emerging trends in Kansas City, like the involvement of more young women, a growing interest in indoor agriculture methods like aquaponics, and an increasing number of urban agriculture nonprofit organizations. Mann himself works for the nonprofit Cultivate Kansas City, an organization acting as a catalyst for the production and consumption of local food in Kansas City. BoysGrow is another noteworthy urban agriculture nonprofit, says Mann. The organization teaches young men from urban areas about farming and entrepreneurship and is especially well-known in the Kansas City area for the value-added products it sells. Through its youth work program, BoysGrow trains young men in the growth, harvest, and sale of crops both in their original form and in value-added products like salsa, BBQ sauce, and ketchup. With the mission of establishing sustainable communities in the most difficult and overlooked places on earth, the Urban Farming Guys are another nonprofit changing the landscape of Kansas City for the better. The organization, which is comprised of a group of self-proclaimed “urban pioneers,” has moved into one of the most dangerous neighborhoods in Kansas City (and the country), the Lykins Neighborhood. Amazingly enough, since they began their urban agriculture experiment in this neighborhood, crime rates have dropped over 20%. 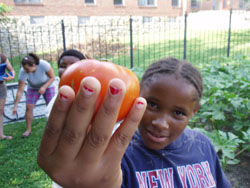 According to Mann, safer communities are a natural benefit of practicing community agriculture in urban areas. “People are outside, they’re seeing what’s going on. Criminals don’t like that. They don’t like people around when they do their stuff. So it’s helping a lot in that regard,” says Mann. The growth of urban agriculture in Kansas City is also benefitting the community by putting empty lots to good use. Mann says Kansas City currently has over 3,000 empty lots and the city spends close to $300 a year on each lot to mow and maintain it. Understandably, the city is actively looking for ways to utilize these lots that save money and contribute positively to the community. Using the lots for urban agriculture is an obvious solution. The city has even received funding from the EPA to test urban lots for contaminants that would make them unsuitable for farming. Mann believes urban agriculture will become an increasingly important component of Kansas City’s economy in coming years, although there are still a few barriers to transcend. The main barrier relates to people’s perception about the price of food. Years of agricultural subsidies, says Mann, have left some consumers with a distorted idea of what food should cost. More and more consumers, however, are aware of the benefits of local food, and this gives urban farmers like Mann hope.